127 mm/38 Mk383 х 2 pcs. 20 mm Oerlikon Mk410 х 1 pcs. Yueyang — Pan-Asian Tier X destroyer. Former U.S. destroyer of the Allen M. Sumner class (USS Haynsworth, DD-700) that was transferred to the Republic of China (Taiwan) in 1970. She was developed from the very successful Fletcher class. In contrast to her predecessor, she had more powerful artillery, but ran at a lower speed. Yueyang is quite similar to Tier X American destroyer Gearing both appearance and play-style wise. However, there are some significant differences between the two; most notably, Yueyang features deep water torpedoes and a choice between the unique Pan-Asian Smoke Generator ( ) consumable or Surveillance Radar ( ). Having similar guns like Gearing, Yueyang has a fair main battery firepower mounted on her deck. However, her main battery reload time is 1 second slower than Gearing. Therefore, in most cases, she can defend herself against destroyers with a slightly weaker firepower than Gearing, peck away at a battleship's health from the unique Smoke Generator ( ) consumable shared by all Pan-Asian destroyers in the tech tree, or dissuade enemies from drawing near with the sheer intimidation factor afforded by being constantly hit by a new salvo every four seconds. In addition, the 127mm mount on Yueyang has slightly more range than the Gearing’s, but not so much to compensate the firepower difference caused by slower reloading. For a destroyer, stealth is everything, and Yueyang does not disappoint in this department. She has the third lowest surface detectability among all Tier X destroyers, edging out the nearest competitors by a slight margin and beaten only by Shimakaze and Gearing with Unique Upgrades. Unfortunately, as Tier X destroyers tend to have worse detection when compared to their Tier IX counterparts, this isn't much consolation. Yueyang also has the second lowest hit pool out of her counterparts, though this isn't as harmful as one would think. She sits much, much lower in the water than Gearing does, making her harder to hit and allowing her to avoid damage her sister ship might have taken. Also, she has better handling characteristics than Gearing; especially considering that Pan-Asian destroyers have no option to take the Defensive AA Fire ( ) consumable, pigeonholing them into using the Engine Boost ( ) consumable instead. The biggest difference between Yueyang and the destroyers of other nations are her deep water torpedoes. With some differences, they are the same torpedoes found on Gearing. They have 3.0 km less range, but travel two knots faster. They both do the same amount of damage, but Yueyang's torpedoes takes longer to reload. However, deep water torpedoes are less detectable at the price of not being able to hit any other destroyers (allies and enemies alike). They are very much specialized at dealing with larger ships, and fulfill this duty admirably. Due to their low detectability, there is almost no time for enemy ships to react to or dodge the torpedoes (less than five seconds before other modifiers are accounted for). Has deep water torpedoes with extremely low detectability. One of the stealthiest Tier X destroyers. Low profile makes Yueyang harder to hit. Option to take great Smoke Generator ( ) consumable or Surveillance Radar ( ). Doesn't have to worry about allied destroyers blocking torpedoes' line of fire. Deep water torpedoes cannot hit enemy destroyers. Surveillance Radar ( ) consumable is short range and duration, and costs use of the Smoke Generator ( ) consumable. Second lowest health pool of Tier X destroyers. Guns have sub-orbital firing arcs that make hitting anything but large targets at long range virtually impossible. As a Tier X ship, Yueyang has no additional modules to research. Similar to other American destroyers, Yueyang can be built to favor guns or torpedoes. However, given that her largest distinguishing feature is the deep water torpedoes, it's advisable to build towards those. The upgrade chosen for Upgrade Slot 6 will largely determine how Yueyang plays. Main Battery (Maximum Rate of Fire) Build: One popular build for Yueyang captains is to stack buffs to her main battery rate of fire. From an upgrade perspective, this means plugging Main Battery Modification 3 ( ) into the third upgrade slot; when paired with Level 3 commander skill Basic Firing Training, it drops her reload speed to a mind-numbing 2.4 seconds. Main Battery (Maximum Range) Build: Also worth considering is the ability to stack Gun Fire Control System Modification 2 ( ) with the Level 4 commander skill Advanced Firing Training and push Yueyang’s main battery range well past 15 km. It is worth noting that shell flight times at such ranges are extreme and landing hits against anything but slow-moving battleships will be incredibly challenging. Torpedo Build: Another popular Yueyang build is to buff her torpedo reload time by stacking Torpedo Tubes Modification 3 ( ) in Upgrade Slot 6 with the Level 3 commander skill Torpedo Armament Expertise. With these skills, her torpedo reload can be reduced to 119 seconds. As with Hsienyang and Chung Mu, Yueyang commanders should start with a base build of: Preventative Maintenance at Level 1, Last Stand at Level 2, Survivability Expert at Level 3, and Concealment Expert at Level 4. The remaining 9 available skill points can be used to tailor Yueyang to taste. Torpedo Build Yueyangs will want to pick up Torpedo Armament Expertise at Level 3. Captains pursuing either of the Main Battery Build Yueyang options will want to focus on Basic Firing Training and Demolition Expert instead. Players concerned about enemy aircraft could opt for Advanced Firing Training or Manual Fire Control for AA Armament. The latter is the better option — as Yueyang will run most of the time with her anti-aircraft guns disabled in order to avoid detection — though Yueyang captains that spend time buffing their anti-aircraft suite are uncommon as they generally do not get much return out of the points invested. 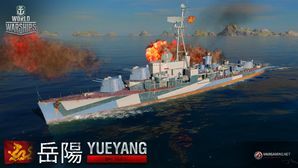 Players who wish to spend doubloons can equip Yueyang with Type 20 camouflage that lowers her detection radius, reduces the accuracy of incoming shells, reduces her repair costs, and increases the amount of experience she earns. Captains who have opted for a Torpedo Build Yueyang will want to equip a Juliet Whiskey Unaone ( ) signal in order to maximize potential damage from torpedo hits. Throwing on a Sierra Mike ( ) is an excellent way to help make up for her slow top speed. November Foxtrot ( ) and Juliet Charlie ( ) are also highly recommended, if available. Main Battery Build Yueyang captains should also consider Victor Lima ( ) and India X-Ray ( ) signals to increase the fire chance of her main battery shells. Yueyang had only one set of torpedo tubes when she was transferred to Taiwan. Her aft torpedoes had been replaced by a quad 40mm Bofors in summer 1945. USS Haynsworth (DD-700) at Federal Shipbuilding in Kearny, New Jersey, the day before her commissioning, 21 June 1944. Haynsworth underway on 5 October 1956, location unknown. Haynsworth docked at Boston Naval Shipyard, 4 July 1962. This page was last modified on 18 February 2019, at 23:59. This page has been accessed 53,550 times.